Australia is set to welcome its tallest building to date, Green Spine, a stunning cantilevered structure composed of two towers, both with a twisting geometric glass facade and terracing. 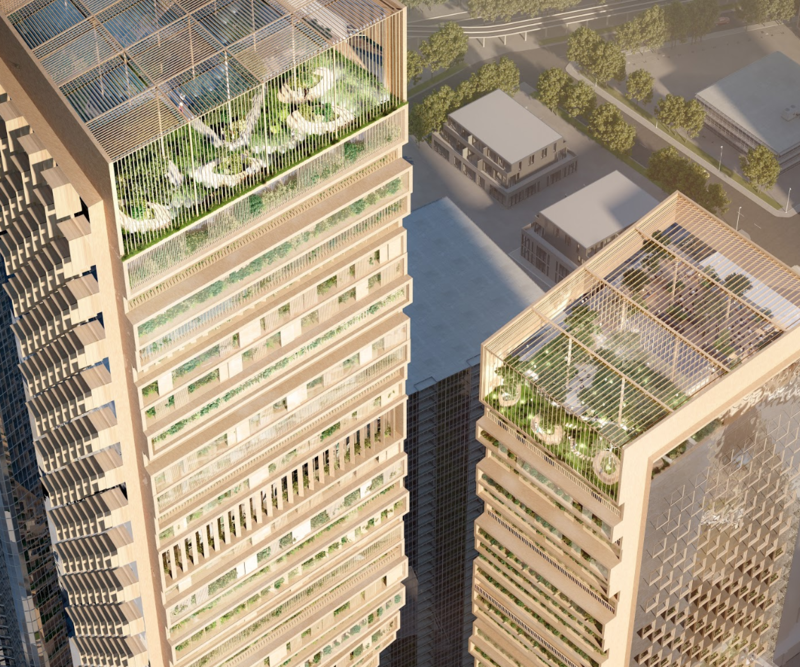 After a worldwide search lasting six months, Green Spine, by Dutch architecture firm UNStudio and Melbourne-based Cox Architecture has been announced as the winning design for the $2 billion plus Southbank site, developed by Beulah International. At 356.20m high, the building will be home to a vertical city of green spaces with a strong focus on culture, paying homage to Melbourne’s diverse population. Competing against six other designs, Beulah International Executive Director Adelene Teh said Green Spine showed work by a strong, multidisciplinary collaborative team that is a bold, yet thoroughly considered approach to creating a context driven landmark as an addition to Melbourne’s skyline. “In its details, the scheme displays a strong intent for well considered public and private amenity, and at street level, the proposal displays qualities that will truly transform the public realm by eroding the hard edges that is prevalent in Southbank,” says Teh. Providing a pedestrian connection at street level through a series of stairs and stepped terraces, the precinct is extended vertically, offering open platforms, a marketplace, meeting places and art installations in a world-class entertainment facility. The lower levels of the towers will also include a vertical school, daycare, library, cinema, auditorium and an Australian-first BMW experience centre. From there, the spine twists into a series of outdoor spaces and green devices along the façades of the two towers, culminating at the top of the residential tower. Opposite will sit a smaller tower, at 252.20m high, that will house commercial offices, a hotel, specialty restaurants and bars. Tim Reardon, principal economist of HIA told WILLIAMS MEDIA inner city areas like Southbank in central Melbourne need to embrace increased density of living. “People like to live close to work and for a metropolitan city like Melbourne this is essential to its continued growth. “There has evidently been very careful planning which is important to ensure liveability in the area. Mr Reardon said from an environmental perspective this type of development can also minimise resource use. “The key challenge for the government is ensuring there is appropriate infrastructure to get to and from the area. He said these types of developments absorb other businesses to meet requirements, and suggested other businesses such as retail and dining will follow suit and go to Southbank. “In Melbourne we have seen significant growth in apartments in the last couple of years. “Early last year half of the apartments built in Australia were in Melbourne.